Presumably, the material that was never shot would have introduced several key characters in Paris, preparing for a grand outing. 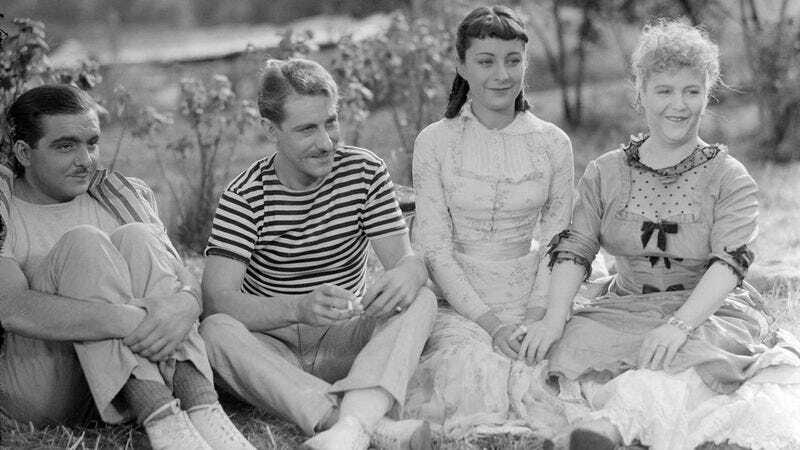 Instead, “A Day In The Country” opens with the journey already in progress, and very quickly sees the family—father (André Gabriello), mother (Jane Marken), grandma (Gabrielle Fontan), young daughter Henriette (Sylvia Bataille), and Henriette’s impossibly dweeby fiancé, Anatole (Paul Temps)—arrive at a rustic country inn, ready to go fishing and have a picnic. Two young local men happen to be in the area, and the wolfish Rodolphe (Jacques Brunius), who actually sports the kind of mustache that can be twirled, suggests to his more thoughtful pal Henri (Georges D’Arnoux) that they make a play for mother and daughter when the men aren’t looking. Henri expresses little interest, fearing an accidental pregnancy that could cause enormous problems… yet it’s ultimately Henri who finds his life forever changed by the boating expedition that he and Rodolphe arrange with the two women. 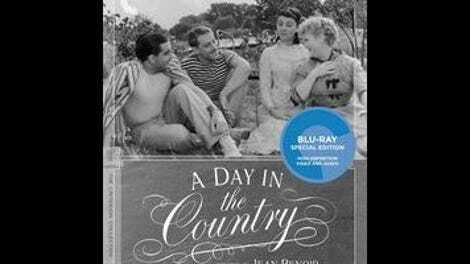 Renoir adapted “A Day In The Country” from a short story by Guy De Maupassant, who was a friend of his father (the legendary painter Auguste Renoir). On the page, it’s a fairly tart depiction of a brief tryst that winds up haunting Henriette and Henri forever afterward, written in Maupassant’s typically matter-of-fact style. (An especially dry sentence gets its own paragraph: “One of the boating men made a martyr of himself and took the mother.”) The text includes occasional bursts of pure feeling, however, for which Renoir finds magnificent visual correlatives. A frank conversation early on between Rodolphe and Henri, sitting at a table inside the inn, builds to one of cinema’s headiest ruptures, as Rodolphe suddenly opens a small window above the table to reveal Henriette and her mother on tree swings in the background. And it’s impossible to describe the expressionistic power of a rainstorm that somehow manages to stand in for the other material Renoir never shot, bridging rapture and heartbreak in a way that obviates any need for whatever he’d intended. What had seemed a cute little idyll turns into an indelibly moving portrait of love and loss, and the effect may be all the more potent for being so unintentionally abrupt. Still, is it worth buying the Criterion disc for a single 41-minute film, even if that film ranks among the greatest ever made? For those on the fence, this edition also features a remarkable 89 minutes’ worth of outtakes—over twice the length of the movie itself!—that beautifully illuminate Renoir’s working method. It’s rare for a film from the early sound era to yield this much behind-the-scenes material, complete with slates and the director’s shouted instructions to his actors. (“Don’t start yet! We have to see the ducks.”) Arguably, that material survived precisely because “A Day In The Country” was never finished, in which case one might well wish for more movies to be abandoned. Completion, in some cases, is overrated.